See the end of this message for details on invoking just-in-time (JIT) debugging instead of this dialog box. ************** Exception Text **************System.AccessViolationException: Attempted to read or write protected memory. This is often an indication that other memory is corrupt. at System.Drawing.SafeNativeMethods.Gdip.GdipGetImageThumbnail(HandleRef image, Int32 thumbWidth, Int32 thumbHeight, IntPtr& thumbImage, GetThumbnailImageAbort callback, IntPtr callbackdata)  at System.Drawing.Image.GetThumbnailImage(Int32 thumbWidth, Int32 thumbHeight, GetThumbnailImageAbort callback, IntPtr callbackData)  at RageLib.Textures.Texture.DecodeAsThumbnail()  at RageLib.Textures.TextureView.listTextures_DrawItem(Object sender, DrawItemEventArgs e)  at System.Windows.Forms.ListBox.OnDrawItem(DrawItemEventArgs e)  at System.Windows.Forms.ListBox.WmReflectDrawItem(Message& m)  at System.Windows.Forms.ListBox.WndProc(Message& m)  at System.Windows.Forms.Control.ControlNativeWindow.OnMessage(Message& m)  at System.Windows.Forms.Control.ControlNativeWindow.WndProc(Message& m)  at System.Windows.Forms.NativeWindow.Callback(IntPtr hWnd, Int32 msg, IntPtr wparam, IntPtr lparam)************** Loaded Assemblies **************mscorlib   Assembly Version: 2.0.0.0   Win32 Version: 2.0.50727.3521 (NetFXspW7.050727-3500)   CodeBase: file:///C:/Windows/Microsoft.NET/Framework/v2.0.50727/mscorlib.dll----------------------------------------SparkIV   Assembly Version: 0.5.3.0   Win32 Version: 0.5.3.0   CodeBase: file:///C:/Program%20Files/Rockstar%20Games/Grand%20Theft%20Auto%20IV/SparkIV-0.5.3/SparkIV.exe----------------------------------------System.Windows.Forms   Assembly Version: 2.0.0.0   Win32 Version: 2.0.50727.3521 (NetFXspW7.050727-3500)   CodeBase: file:///C:/Windows/assembly/GAC_MSIL/System.Windows.Forms/2.0.0.0__b77a5c561934e089/System.Windows.Forms.dll----------------------------------------System   Assembly Version: 2.0.0.0   Win32 Version: 2.0.50727.3521 (NetFXspW7.050727-3500)   CodeBase: file:///C:/Windows/assembly/GAC_MSIL/System/2.0.0.0__b77a5c561934e089/System.dll----------------------------------------System.Drawing   Assembly Version: 2.0.0.0   Win32 Version: 2.0.50727.3521 (NetFXspW7.050727-3500)   CodeBase: file:///C:/Windows/assembly/GAC_MSIL/System.Drawing/2.0.0.0__b03f5f7f11d50a3a/System.Drawing.dll----------------------------------------RageLib.Common   Assembly Version: 0.5.3.0   Win32 Version: 0.5.3.0   CodeBase: file:///C:/Program%20Files/Rockstar%20Games/Grand%20Theft%20Auto%20IV/SparkIV-0.5.3/RageLib.Common.DLL----------------------------------------RageLib.FileSystem   Assembly Version: 0.5.3.0   Win32 Version: 0.5.3.0   CodeBase: file:///C:/Program%20Files/Rockstar%20Games/Grand%20Theft%20Auto%20IV/SparkIV-0.5.3/RageLib.FileSystem.DLL----------------------------------------System.Xml   Assembly Version: 2.0.0.0   Win32 Version: 2.0.50727.3521 (NetFXspW7.050727-3500)   CodeBase: file:///C:/Windows/assembly/GAC_MSIL/System.Xml/2.0.0.0__b77a5c561934e089/System.Xml.dll----------------------------------------System.Configuration   Assembly Version: 2.0.0.0   Win32 Version: 2.0.50727.3521 (NetFXspW7.050727-3500)   CodeBase: file:///C:/Windows/assembly/GAC_MSIL/System.Configuration/2.0.0.0__b03f5f7f11d50a3a/System.Configuration.dll----------------------------------------7puptn5c   Assembly Version: 0.5.3.0   Win32 Version: 2.0.50727.3521 (NetFXspW7.050727-3500)   CodeBase: file:///C:/Windows/assembly/GAC_MSIL/System/2.0.0.0__b77a5c561934e089/System.dll----------------------------------------RageLib.Textures   Assembly Version: 0.5.3.0   Win32 Version: 0.5.3.0   CodeBase: file:///C:/Program%20Files/Rockstar%20Games/Grand%20Theft%20Auto%20IV/SparkIV-0.5.3/RageLib.Textures.DLL----------------------------------------ICSharpCode.SharpZipLib   Assembly Version: 0.85.5.452   Win32 Version: 0.85.5.452   CodeBase: file:///C:/Program%20Files/Rockstar%20Games/Grand%20Theft%20Auto%20IV/SparkIV-0.5.3/ICSharpCode.SharpZipLib.DLL----------------------------------------************** JIT Debugging **************To enable just-in-time (JIT) debugging, the .config file for thisapplication or computer (machine.config) must have thejitDebugging value set in the system.windows.forms section.The application must also be compiled with debuggingenabled.For example:<configuration>   <system.windows.forms jitDebugging="true" /></configuration>When JIT debugging is enabled, any unhandled exceptionwill be sent to the JIT debugger registered on the computerrather than be handled by this dialog box. I have no problems running any other mod or program for IV and the game runs great on here..
F*** all the rest, IV is the best. where are the interiors textures ? 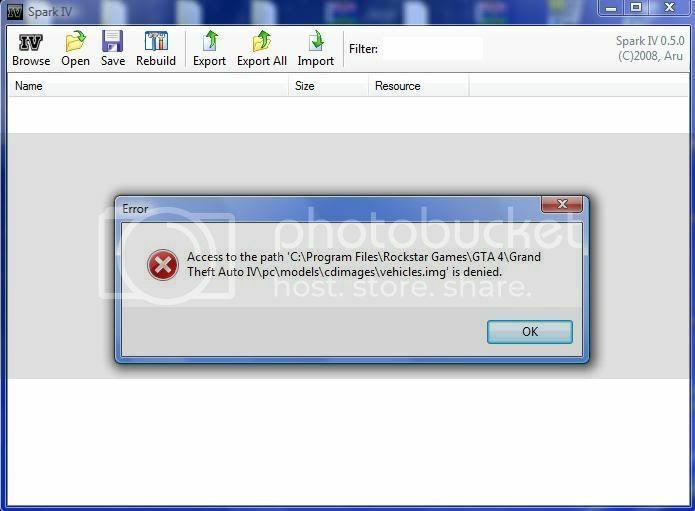 I downloaded the requirments and bought GTA 4 and when i tried opening it it didnt work..
so what do i do if i want to get rid of the files? New version 0.5.4, updated on the first post @ here. There's a critical bug fix, so updating is highly recommended. @LaMuerteX/pinky... should be fixed with 0.5.4. @HomeInmyHEad... when you imported the file, you OVERWROTE and REPLACED the existing files with the same name. SparkIV does not currently support adding new files or deleting existing files as that functionality will only be required once we have the ability to create new files from scratch. I hope you read and followed the warning about creating backups, and if you did, you should be able to restore those files from the backup img/rpf. A small suggestion, you could do that when you save an image or load, leaving the name of the texture like openIV and not have to manually type the name, is something that saves us work to publishers. very grateful. and one question, it would be possible to create an option for expanding the size of a texture? for example if this is 128x to 256x resize you think? is very useful for me if possible, some textures and helmets, the quality is perfect but at 256x niko has 2 of 3 are 128x texture and detail is somewhat low, get an option to resize be a very good thing for me that could improve many The Game of small details. HELP ME y do i get this error ?? Double check again i see your using vista so search .img in GTAIV directory press CTRL+A click properties and then uncheck the readme attribute works for me. Have you modded the file using Open IV previously to using Spark IV? If so you will probably need to return to the origonal file, I had the same thing with the playerped.rpf file. I have a suggestion for the next version. It would be great if we could select to apply a texture on a clothing model, from playerped.rpf. It would be really great when skinning outfits, cause we wouldn't need to go in-game everytime. Would that be possible? I mean like, make a menu, so when you view a clothing model, you can select to appply one of the several wtd files that outfit uses. Nice idea, would save a bit of time. Firstly, I have to say that your Tool is really great! It works very well. I changed nearly every billboard texture in the "Manhatten" Area so far. But some of them I can't replace. For example: In the .img archive "manhat09" there is one file named "ts_branding3_dc9.wdr". And if I want to edit this one, I got an error message. I can ignore this error and open the file anyway. But then he show me only 6 textures which I can replace. The rest of them (in all 21 textures) I can't see. But I can see them if I open this file with the "view" button of your program. So, can you help and explain me why this don't work with only this file? @LaMuerteX... can do. Will add to next version. @simkas... will add to the list of things to do. @FUBAR... its a bug, and its fixed in svn. Will be included in next general release. Aru, may I ask you a favor? Add a "Drag & Drop" ability, to open IMG/RPF files. Will be very useful, because I'm easly lost with the embedded browser! --- update: or maybe a "favorites" thingy ? System.IO.FileNotFoundException: Det går inte att läsa in filen eller sammansättningen ICSharpCode.SharpZipLib, Version=0.85.5.452, Culture=neutral, PublicKeyToken=1b03e6acf1164f73 eller ett av dess beroenden. Det går inte att hitta filen. heres an important question, can i somehow use 1024 texture on the car intriors, im looking to do some modified interiors but cant seem to get higher than 512, spark loads the 1024 maps into the files, but when i play the game they are shrunk to 512. @Ftmch... it's trying to load ICSharpCode.SharpZipLib.dll but cannot find it. Did you extract all the files? @relliksoul.. SparkIV will automatically resize all imported textures to the original size. It doesn't support changing the texture dimensions unfortunately. anything possible in the future? dude im so lost, yes im a nub at this modding stuff but what does this tool exactly do ? Replace/Attach some pics or other files to the current ones ? and exactly how does this work ? I suggest "Change Level" update, like OpenIV.. So if I change a texture with SparkIV, it will appear in the game always?